With AVA Knowledge Base Plugin your customers can find answers online and you receive less support requests. AJAX powered live search with article suggestions. Incredibly useful to help your customers find answers - fast! No need to call or email you. Live Search could also help your current and potential customers find alternatives to what they were looking for or even additional items they hadn’t previously considered. That could mean more sales! 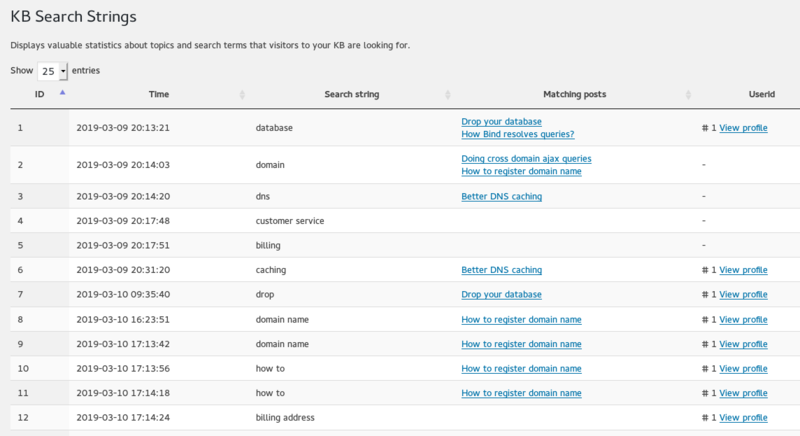 You can see all search strings used by your visitors. And what is even more useful - the results of those searches. You can see what posts match search keywords and if nothing is found. So it's easy to improve your Knowledge Base even more. The more answers your customers can find online, the less support requests you receive. We use this plugin on our Knowledge Base, of course! Display most popular posts, recent posts, related posts and selected posts for your customers. Not every customer knows what they are looking for, so these provide even more possibilities for your customers to learn about your products and services. What could be more valuable than customer feedback? AVA Knowledge Base Plugin makes that super easy. Your customers can make simple thumb-up or thumb-down votes on Knowledge Base posts. They also have a chance to provide more detailed comments on how to improve articles. which saves you money and time and can win you even more sales. If you don’t like it, for any reason – just cancel your order. We offer two weeks money back guarantee.